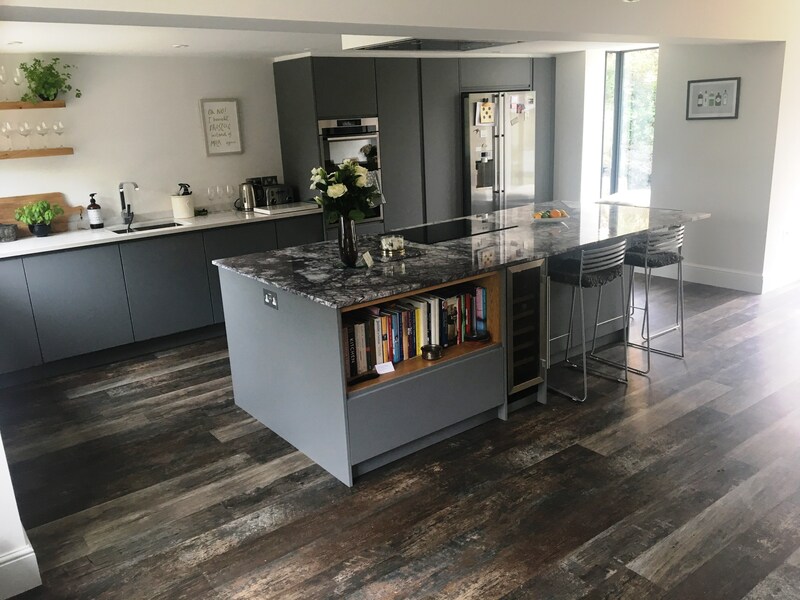 Residential clients have recently completed a project to extend and improve their kitchen after using our design and planning application service. The old kitchen/breakfast room was relatively small and had an awkward configuration. We suggested firstly creating an opening through to the adjacent double garage to integrate some of the space, and secondly the construction of a small rear single storey extension. Though relatively modest in scope, the design scheme has allowed for the creation of a much larger usable space. Modern grey kitchen units and a combination of a marble-topped central island with cream work tops make for a stunning finish. Large sliding doors were installed in the rear extension leading into the back garden, and the garage door to the front elevation has been replaced by a small window which gives the appearance of having always been there. The homeowner is absolutely thrilled with the finished result and the new kitchen has already drawn many compliments from friends and family! This entry was posted in construction, design, extension, House Extension, planning consent, planning permission, renovation, Residential on July 19, 2018 by admin.